I stopped at my favorite semi-local Scotch source, the Party Source in Newport, KY, this week. It’s about a 50 minute drive, but it’s really worth it. 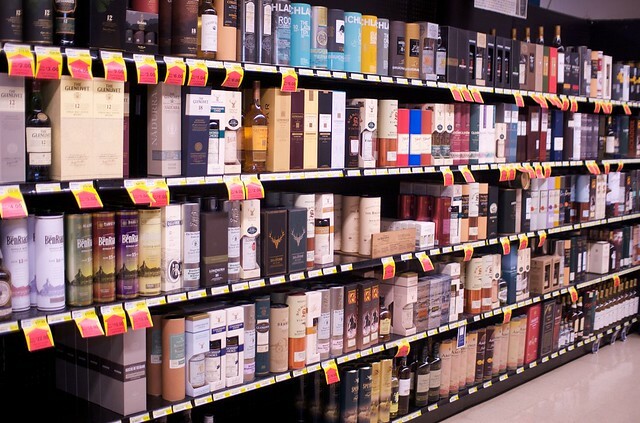 Most of the prices are pretty good overall, and they have one of the best selections of any liquor store within a decent drive. So my latest trip was to scout out some of the higher end things for the barbecue group to be choosing from, as we do our first blind taste test next weekend. 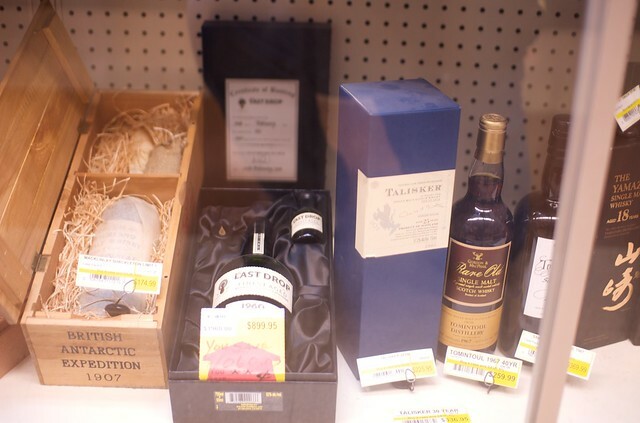 I wanted to see if I could find a Bruichladdich, the Laddie Ten, and I noticed that they also had Talisker 18-year-old for $59.99, while the 10-year-old was $57.99. 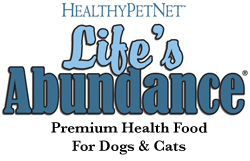 8 years older for just $2… That’s just 25 cents a year! So I had to get a bottle. The first I ever heard of Talisker was about 20 years ago, in a really odd way. I met a couple that got a Labrador Retriever from the same breeder where I had just gotten my lab puppy, Woody. The couple got a yellow lab (the above is Woody as a pup) and named him Tally, after Talisker whisky. Back then, I knew almost nothing about whisky (not that I’m an expert now, either), but I remember trying Talisker and thinking it was a little rough. However, just a few weeks ago found me sitting at one of my favorite restaurants with a glass of Talisker 10-year-old sitting in front of me, and then me really enjoying it. Appearance: It looks like whisky. 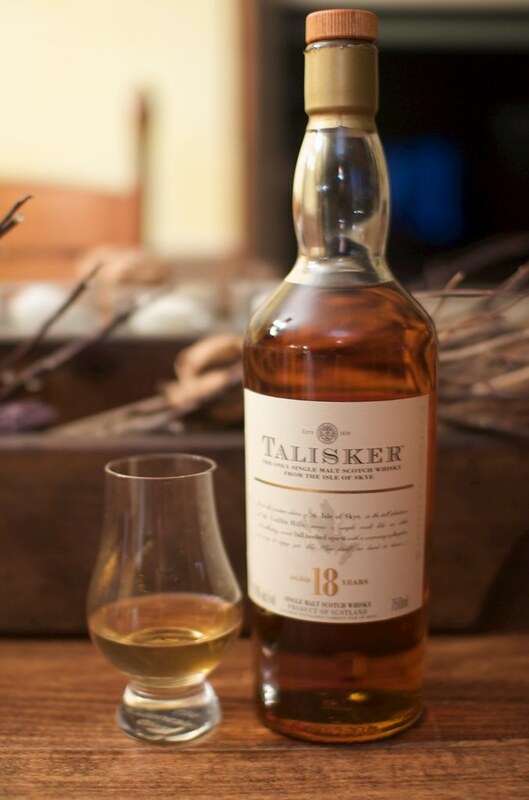 It’s a good, strong amber, without sherry ruddiness, and dark enough to guess that it may have been in a barrel for a while, but it’s likely that Talisker used e150 (caramel color), which is why appearance isn’t that big of a deal. citrus. The campfire and smoke had some peat in the background, but kind of behind everything else. The whisky, for a non-Islay malt, just smelled masculine. Unlike sherried whiskies like the Macallan, the scent of this whisky made no bones about its gender. Have you ever smelled the male and female versions of a cologne with the same name? They’re similar, but one is more masculine, one more feminine? In the world of whisky, this whisky took that masculine and called it a sissy. Taste: Very malty up front, not too sharp, white pepper and honey, plenty of smoke and wood, charcoal and blue smoke from a barbecue pit. The mouthfeel is thick, but not syrupy. There’s a bit of toffee and cocoa in there, too. This whisky is nicely balanced, still firmly on the side of testosterone. There’s a nice amount of sweetness to this, but it’s not over the top. The smoke/peat comes through after it to balance it well. Finish: The finish is medium long. Meringue baked on a Big Green Egg, eaten by the campfire. Overall: This brings to my mind some of my BBQ friends making up desserts on their smokers, up all night seeing who comes up with the best of the bunch, and the while sharing drams of whisky. BBQ use: grilled pork chops served with apples stewed in cinnamon and Talisker. If you haven’t guessed what I think… Get some of this stuff! I’m jealous! Talisker is the first scotch I loved, at that point the only single malt I’d had before was Glenfiddich. And Talisker is responsible for me having an interest in scotch, too, it was so different from anything I was drinking up to that point. I have a 200ml 10 yr bottle in a sampler package waiting patiently — I want to have a wider scotch experience before doing its review. It will be interesting to see if the love remains. It seems James Bond agrees with you… In Bond movies, if he’s not drinking martinis, I hear he drinks Talisker. I like the 10 year old, but for only $2 more, I love the 18 year old. There are other whiskies I’d go to first, but Talisker will likely be a regular on my shelf from now on. Wow, that sounds like a great whisky, and for $59.99! Your reviews are so thorough, I’m almost able to taste the whisky while reading it. 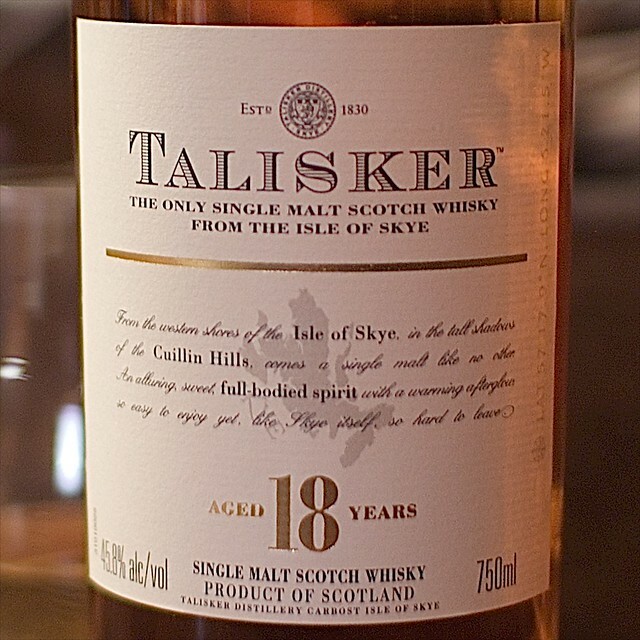 I checked online at some of my local places and found they all had Tallisker 10YO for around $55 – $60. None of them had Tallisker 18YO. Hopefully someday, as it sounds fantastic. I suppose trying the 10YO first would be better anyway. The 10 year old is worth having anyway. 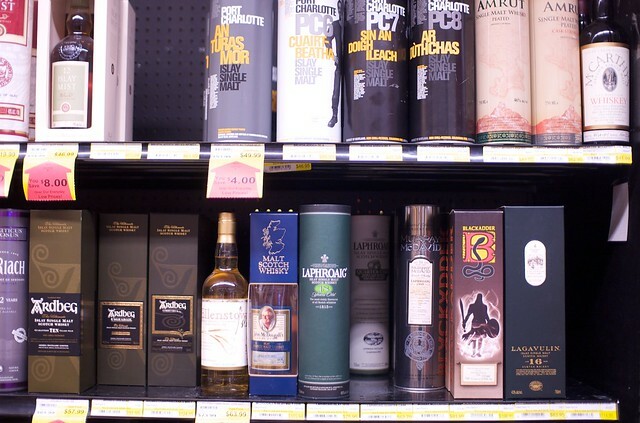 For the extra $2, the 18 is more than worth it, but a lot of people havecthe 10 as their go-to whisky. If I was gonna have a go-to whiskey, for $2 more, I’m thinking it would have to be the 18 yo. lol I’m enjoying the blog, Curt. 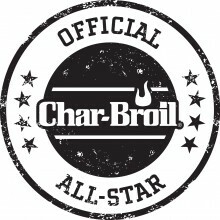 I have to laugh when I read all the reviews, both here and on the bbq site. I keep seeing things mentioned for nose and taste that I’ve never smelled or tasted, and thinking to myself, “how the heck am I supposed to know that a whiskey tastes or smells like something, if I’ve never tasted or smelled the thing to begin with?” lol Well, I’m getting an education, if nothing else. Thanks, Curt! I need to keep working at it, if I’m describing stuff nobody gets! Trust me, when I read these back, I have a long way to go until I don’t sound pretentious and/or stupid. Thanks… And I know what you mean about “need”. I “need” to get another bottle of Lagavulin 16 year old!